I wanted to make a story of an event which is separated by rooms and borders. Each section is enriched with elements, representing the moods, actions and characters that ends with a dramatic twist. The final scene is not concluded but provocative that leaves the audience to imagine their own ending. The tones that Manet had establish for this painting was subtle, non-dramatic but tragic. The color palette and strokes, pitched to provide the focus and attention solely on the subject matter without stealing any of its limelight. I like the somber tones on the painting, it is moody, lonely and quiet similar to the concept that I applied to my film. Instead of grayish-bluish colours, I used white and beige to achieve the same results. My film required a lot of emotions which did not only come from the actors’ performance alone rather the tones projected from the ambience have given it an uplift to achieve the moods required. The theme has taken over the composition. It doesn’t require stressing the dynamic or dramatic composing. Manet wanted to express a realistic approach of realism in capturing a tragic moment like this. 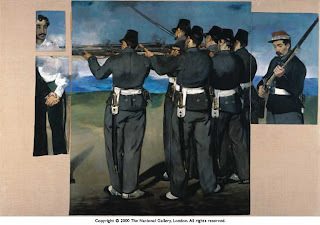 This is a brilliant approach as Manet used composition subtly by placing the character with a virtual space representing the character’s expression of thought and situation. The ’post effect’ of physically being separated into pieces enhanced and carried the intended separated room to a new dimension. This is realism, as in the story of my film, a situation that can happen anywhere and to anyone. As Manet tried to achieve in the painting, I have tried the same to maintain the sincerity throughout the movie by not pushing the story over the top or staging it too dramatically, instead letting it flow naturally. I have applied long takes to capture the emotions on screen to give the audience the first hand experience; uncut and uncensored. I concentrated on the element of ‘post effect’. I am more interested on the implication of the missing element; (the life, the power that was put away such as the pieces of the painting that were missing our cut out from the original painting) why did this happened?, what is the appreciation when did the newer composed images were put together? Would it depreciate its esthetic value or would it give new meaning and bring a whole new perspective to the painting? As with my film I tried to study the post effect of a situation (separation) with its implication and the ripples caused by the conclusion. I liked the way the characters were staged in a space that enhanced their profiles. Character placement was thoughtfully considered and the fragments somehow (from my point of view) gave a visual separation that heightens the interest in the composition. I tried to achieve this in my film by placing my characters in their own individual room to suggest profile, moods and emotions. I even cropped out a character’s face (mother) to hide her disappointment, memories and her doubt in reflecting the decision that she had made. This is a conceptual drama capturing the life of a broken home. It all happens on the day when the husband and wife’s divorce is final. This is an inner-emotion study on the Man as a husband and father. The Woman as a wife, mother and lover. The daughter who is wedged in the middle and the lover as a solace or perpetrator. This story is told in a series of chronological events that are separated by rooms and borders visually and conceptually to represent the character’s relationship in real life. Each sections are enriched with elements, representing the moods, actions and characters that ends with a dramatic twist. The final scene is inconclusive but provocative and left to the audience to imagine their own ending. A simple subject matter with a lot of weight, dragging a simple family story to become emotionally complicated. III. Mike Leigh - Vera Drake (2005) In this film, a soft character ‘Mother’ was the evil one resulted by her principal and the decisions she made. The same concept from the beginning is reintroduced to emphasize Anita’s troubled journey when entering the woods as opposed to her heightened self revelation when leaving the woods. There will be a range from wide to close up shots intertwine with another by the use of foreground tree trunk as transition. This is the last scene where Anita walks out to the pavement away from the camera with the wind blowing quietly around her. Even though this is the conclusion scene, we don’t want to suggest the end but only provoke it and let the audience create their own resolution based on their own appreciation. The winds can be the soul of the dead man or even the woods who will always be there to protect Anita. The woods provide her courage and graduate her on her self discovery as what she experiences in the woods . The following will explain how I put my thoughts in every shot, how I instill mise-en-scene and give every shot a meaning. I have highlighted intriguing solutions that I made on the storyboard; as some were shot accordingly, some were improvised on the set based on factor of location, weather and time constraints and some were based on the director’s final decision which I applaud by looking at the final results. Conventional treatment for intro scene normally start with establishing shot to get an understanding of location and situation and continuing to zoom in to focus on the subject matter. For Four Eyes we wanted to establish the concept of trapping the characters to the coincidence that escalate to reactions of no escape. A cramp shot was used to reflect this mood that gave the audience a trapped feeling and was forced to work out the meaning of this close up montage, consequently coming to the understanding of the story when the camera went wide to establish the location and situation. 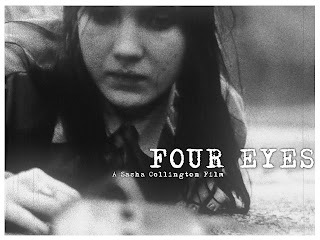 The shot for Four Eyes introduction scene was created to summarize the story in a visual composition that deliberately projected the meaning. A continuous built up pace via editing was used to generate the mood of suspense to its dramatic moment. 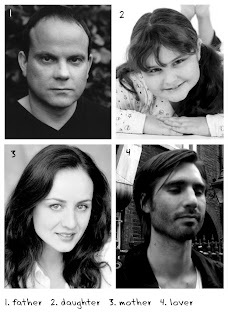 A close up subject in individual form introduced moods focusing on the characters. A continuous dramatic mood build up this suggestion that the main character (Anita) no longer cares about the bullying by the antagonist (the boys). This is established by the use of annoying elements that stick in Anita’s hair as a result of ignoring what the boys have done to her. The boys tease and throw sticks to her and she is now used to it. She bows her head down and continues on with life until the boys get more aggressive as suggested by the movement pace on (Storyboard scene 1_5) the boys march faster while she is still in her reserve pace (Storyboard scene 1_6) and the impact comes when she is pushed down and destructive falls down which later changes her life. 1. 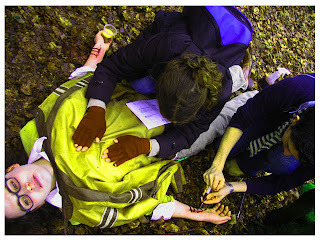 Anita was cornered to a cramp space and visually separated by an element assisted by the woods. 2. The boys determined to hurt Anita and visually push forth the separation border and eventually get to Anita. A shot is being given life and statement. 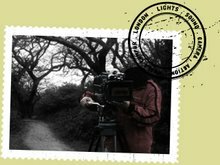 (Long lens and move far away from the actions) Camera suggests from the point of view of the woods, an element of saviour a force awakens to rescue the damsel in distress. The Idea for this movie is wicked and it has this surreal influence which works well with me. I think I can give my utmost on this because this was the genre that I love and this story can be layered with a lot of ideas than it seems. Given to producing this in black and white I think it will give more values to this kind of genre and I can see it has the potential to be a good movie. I would also like to explore and experiment on a lot of things and ‘Four Eyes‘ is the best bet. I have taken the responsibility to create the storyboard for Four Eyes. When I first read the script, I knew that this is a movie that can be visually interesting. I volunteered myself to do the storyboard for the movie because I saw an opportunity to make a film that I am interested in. Although I am not in the director’s chair, this is a potential platform for me to demonstrate my conceptual direction on the storyboard. I have spent a lot of hours working on the storyboard with the director of photography and film director. Together we studied every shots to make each single shot worthy. To me storyboard is an important stage of pre production. Directors like Hitchcock and Spielberg normally would emphasize on storyboarding, while some directors find it too rigid. In my opinion, there is no right or wrong to this matter because it all depends on the director’s preference. 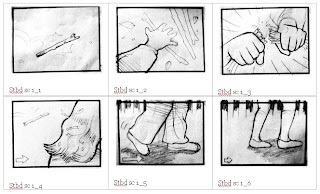 However, from my experience a storyboard plays a pivotal role in planning and preparing the set and helps to communicate with the rest of the production crews on what to achieve for the film. Storyboards would not be the infinite plan because the director may improvise it later on the set if required. By working on this task, I will be involved in the creative decision making process at an early stage.